After a lot of confusion about the date Vettai would actually release in Melbourne, the film finally made it onto a screen in one of the chain theatres on Saturday night. And it was well worth the wait! For anyone a little unsure, there are at least 3 reasons to see this film. Madhavan and Arya onscreen together (surely the perfect pairing!). English subtitles – even the songs (something that not even every Hindi film can manage). And the absolute winner – there are no comedy uncles! It’s a really funny film with great one-liners but no separate comedy track since the humour comes from the two main leads. From some of their previous films I knew that both actors were good in comedic roles, but the two of them together make for some of the best and funniest comedy I’ve seen in a Tamil film. Add in two very strong female characters and an assortment of stalwarts in the support cast, and it all adds up to some great masala entertainment. It’s a tale of two brothers. Madhavan is Thirumurthi, the elder of the two, and basically a wuss. He is upset by violence and is unable to stand up for himself in a fight. Luckily he has his younger brother Gurumurthi (Arya) to do this for him. No matter what the situation, Guru will come running to his rescue at the call of ‘Thambi’ but especially if it involves the chance to be involved in a major punch up. It’s a twist on the more usual story where the elder brother rescues the younger, and their relationship forms part of the comedy in the film. Although Madhavan could have played Thiru as a total coward, he makes him more timid and sensitive rather than just frightened, while Arya’s Guru is more caring and perceptive than first appearances would seem. After the death of their father, Thiru allows himself to be ‘persuaded’ to become a police officer and thus follow in the family tradition. After his training, he is posted to Thoothukudi district where two gangs of rowdies are feuding with each other and generally terrorising the town. As the newest police officer, Thiru gets roped into dealing with Annachi (Ashutosh Rana) and Mari (Gaurav) although in reality it’s Guru who takes care of his assignments while Thiru basks in the praise of his fellow officers. Sisters Vasanthi (Sameera Reddy) and Jayanthi (Amala Paul) are introduced by an excellent song where they discuss the ideal husband – no pencil thin moustaches and no big bushy historical ones either seems to be quite a reasonable requirement to me. It’s beautifully shot by cinematographer Nirav Shah and it’s great to have a song with just the two lead actresses by themselves. Vasanthi meets Guru after an incident in the street and despite their initial clashes Guru advises his brother that she would make him the ideal wife. Meanwhile Guru falls in love with the rather less acerbic Jayanthi although the two have to negotiate the obstacle of a potential NRI groom (Rajeev Ravindranathan) picked out by Vasanthi for her sister. The second half is a little darker and the fight scenes become more intense and threatening as Annachi and Mari try everything they can to get rid of Thiru. Annachi attempts to terrorise Vasanthi which doesn’t work at all, and his next ploy to kidnap Guru and force Thiru into submission backfires as spectacularly as expected. The final showdown is brilliantly executed and it’s great to see the two heroines with important roles to play in the climax rather than being shuffled off or used solely as victims. Although the story itself is fairly predictable and there are some rather large plot holes, overall Vettai is great fun. 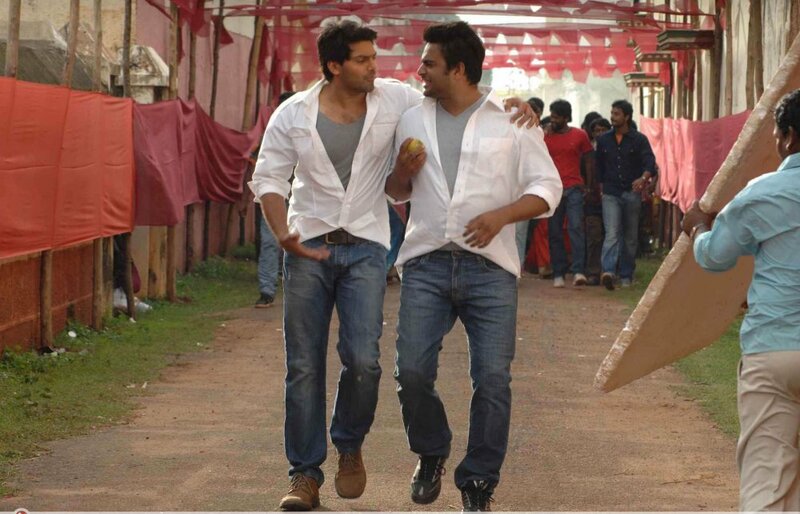 Madhavan and Arya have fantastic chemistry together as the on-screen brothers and both seem perfectly cast. Madhavan looks slightly over-weight and’ soft’ which befits his character although later on in the film he does buff up a bit as he starts to fight back. And yes, I did enjoy those scenes! 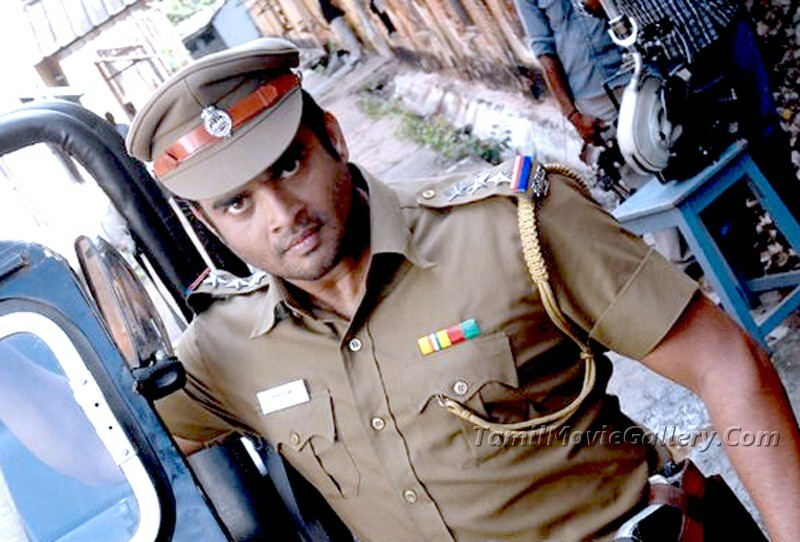 Madhavan has some great expressions as he shows how flattered Thiru is by the respect he gets purely as a result of his uniform and contrasts it with his horror at the violence he sees around town. He gets it just right to make Thiru a sympathetic character rather than solely a figure of fun as he tries to dodge the rowdies and accept the lavish praise from his boss. Nasser is hilarious here in a cameo role as Thiru’s over enthusiastic superior officer and makes the most of his short time onscreen. Arya is literally a one-man army and looks amazing as he punches his way through entire gangs of rowdies, but still has time to rescue an injured dog. What style! He keeps his facial expression very deadpan during some of his funniest dialogues, but there is a gleam in his eye and he totally looks the part of the ultimate bad boy. He’s a force to be reckoned with in every respect. Guru’s protectiveness of his older brother is really very sweet and underneath the tough exterior it’s obvious that he really cares. The brothers’ relationship is very well written by Lingusamy, but it’s the performances that make it come to life and give the film such a solid base to build the story. Sameera Reddy and Amala Paul are both very good in their roles. Sameera’s Vasanthi is a very strong and forceful character and she manages both the comedy and the drama equally well while establishing good chemistry with Madhavan. Amala Paul was very impressive in Mynaa (the only other film I’ve seen with her) and she’s equally good here. Her character has excellent rapport with Guru and there is plenty of sensuality in her portrayal without resorting to skimpy outfits. There is one song where she had Western clothes but the hemlines are kept reasonable and the outfits fairly respectable (by film standards at least!). Other than that, both sisters have some stunning outfits and look absolutely beautiful throughout. I really like the songs by Yuvan Shankar Raja and they seem to suit the overall feel of the film. Sadly Madhavan really only dances in the first song, but Arya more than makes up for that with some great moves in the others. Amala Paul just manages to keep up with him. The fight scenes are well choreographed, and although Ashutosh Rana isn’t a very villainous villain, his various side-kicks and henchmen are plenty vicious and nasty instead. Vettai is a film that balances the action, comedy and romance very well, and the star power of the leads makes it a step above a standard masala flick. I loved it and thoroughly recommend watching! This entry was posted in Kollywood and tagged Amala Paul, Arya, Ashutosh Rana, Gaurav, Madhavan, N. Linguswamy, Nasser, Nirav Shah, Rajeev Ravindranathan, Sameera Reddy, Tamil, Thambi Ramayya, Vettai, Yuvan Shankar Raja. Bookmark the permalink. -I actually found the villains pretty menacing. I appreciate it sometimes when films take the time to show how awful violence is. SPOILERS: The flaming goonda, murder of the daughter, beating of Guru, and slaughter at the police station actually worked to make Ashutosh Rana’s character (and the other guy) much more menacing to me. -Vasanthi didn’t seem to be 9 months pregnant at the end, so I was kind of worried about her pains. I would have liked the epilogue to show a healthy baby, but it was probably assumed that she was ok. I must admit I hadn’t really thought about Vasanthi not looking 9 months pregnant but you’re right – she didn’t! I agree that the violence was pretty graphic- the burning man in particular was very shocking and really realistic! I thought that while Mari was involved in a lot of the violence directly and was a more typical thug, Annachi tended to sit around and give orders without any of the filmi villainous attributes of gloating, maniacal laughter or general signs of insanity. Although that makes him more realistic and more frightening really. 🙂 This was such a good masala film, do try and watch it if you can. This is showing in Hoyts here, so I was quite surprised that the audience reacted as much as they did! I will definitely get the DVD and watch it again though as I’m sure I missed a lot when I was laughing so much I was crying – it really is very funny! Good strong female characters too with great chemistry between all the lead actors too. It only ran here for a few days – 1 show a day at 3 cinemas for 5 days, so I am very lucky I managed to see it. Hopefully there won’t be too long a wait for the DVD as I really want to watch it again. I would have gone a 2nd time if it had still been showing here!! LoL at “No comedy uncles”. I tried googling show timings in Sydney – alas no show. Strange when Nanban is being shown in prominent Event/Greater Union cinemas. It is not even showing up on Hoyts page in Sydney. Comedy uncles are the bane of many an otherwise good film! I like the actors when the comedy routine forms part of the story and there is a reason for it to be there. When there is a “comedy” side plot just so that the “comedy uncles” can do their stuff then they drive me crazy!! I really wanted to see this so I did hassle both Event cinemas and Hoyts, but really the distributors seem to have done a woeful job in promoting and delivering this film in Australia. Nanban has 3 shows a day and has been showing since 12th and Ayngaran have done a much better job in promoting it too. Will have to wait for the DVD. Apparently it was shown only for 3 days ie Wed to Fri – one show a day in the evening at Hoyts Weatherhill Park in Sydney – perhaps that was the cheapest place to screen it – who knows the logic of these distributors. I had no idea about this film until I read your blog! Thanks for bringing it to my attention. Usually tamil or telugu films are only shown at one or two cinemas. This time Nanban has been shown at quite a few places which in Sydney. A friend recently saw Mahesh Babu’s Businessman at Burwood event cinemas in Sydney. She had to pay $22.50 for her ticket! Looks like some private distributor is arranging for telugu films to be shown by hiring event cinemas for a few shows. Sad state. The Telugu films only ever show at the one cinema and generally Tamil films only show at two. One of those is a very small cinema on a University campus so it’s not very accessible either, although it does have the advantage of Indian snacks on sale at the interval – yum! The only exception has been 7 Aum Arivu and Vettai which were at Hoyts. I’m hoping that it’s the start of a trend and that it leads to more films releasing with English subtitles. But they need the support which they will only get if they advertise!